Not to be confused with Family Radio. 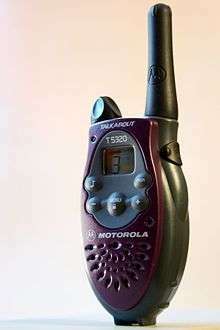 The Family Radio Service (FRS) is an improved walkie-talkie radio system authorized in the United States since 1996. This personal radio service uses channelized frequencies around 462 and 467 MHz in the ultra high frequency (UHF) band. It does not suffer the interference effects found on citizens' band (CB) at 27 MHz, or the 49 MHz band also used by cordless telephones, toys, and baby monitors. FRS uses frequency modulation (FM) instead of amplitude modulation (AM). Since the UHF band has different radio propagation characteristics, short-range use of FRS may be more predictable than the more powerful license-free radios operating in the HF CB band. FRS radios use narrow-band frequency modulation (NBFM) with a maximum deviation of 2.5 kilohertz. The channels are spaced at 25 kilohertz intervals, with all frequencies ending in 2.5 or 7.5 kHz. FRS radios are limited to 500 milliwatts according to U.S. Federal Communications Commission (FCC) regulations. Channels 1 to 7 are shared with low-power interstitial channels of General Mobile Radio Service (GMRS). A license is required for those channels if the power output is over FRS limits. FRS stations on channels 1 through 7 may communicate with GMRS stations on those shared channels; the GMRS stations may use up to 5 watts of power, while the FRS stations are restricted to 500 milliwatts (half a watt). All equipment used on FRS must be type accepted according to FCC regulations. Radios are not type-accepted for use in this service if they exceed limits on power output, have a detachable antenna or for other reasons. FRS radios must use only permanently attached antennas, such as walkie-talkies; there are also table-top FRS "base station" radios that have whip antennas. This limitation intentionally restricts the range of communications, allowing greatest use of the available channels. The use of duplex radio repeaters and interconnects to the telephone network are prohibited under FRS rules, unlike other radio services. FRS manufacturers generally claim exaggerated range. The presence of large buildings, trees, etc., will reduce range. Under exceptional conditions, (such as hilltop to hilltop) communication is possible over 60 km (37 mi) or more, but that is rare. Under normal conditions, with line of sight blocked by a few buildings or trees, FRS has an actual range of about 0.5 to 1.5 km (0.3 to 1 mile). Hybrid FRS/GMRS consumer radios have been introduced that have 22 channels. Many of these radios have been certified for unlicensed operation (on the 7 FRS frequencies, channels 8–14) under FRS rules. The FCC rules and statements regarding the use of hybrid radios on channels 1–7 stipulate the need for a GMRS license when operating under the rules that apply to the GMRS. Many hybrid radios have an ERP that is lower than 0.5 watts on channels 1–7, or can be set by the user to operate at low power on these channels. This allows hybrid radios to be used under the license-free FRS rules if the ERP is less than 0.5 watts and the unit is certified for FRS operation on these frequencies. In the United States of America, operation on channels 15–22 requires an FCC GMRS license. Interference to licensed services may be investigated by the FCC. Channels 8–14 are exclusively for FRS. Accordingly, GMRS operation is not allowed on these channels. Channels 15–22 are reserved exclusively for GMRS. As noted, FRS operation is not allowed on these channels. Personal UHF radio services similar to the American FRS exist in other countries, although since technical standards and frequency bands will differ, usually FCC-approved FRS equipment may not be used in other jurisdictions. American-standard FRS radios have been approved for use in Canada since April 2000. As of 2016, only low-power (2W ERP), half duplex GMRS operation is permitted, but a license is not required. Repeater and high-power operations are not permitted. This allows the use of dual-mode FRS/GMRS walkie-talkies, but precludes the use of higher-powered devices designed for vehicle and base-station use. Since tourists often bring their FRS radios with them, and since trade between the U.S., Canada, and Mexico is of great value to all three countries, the Mexican Secretary of Communication and Transportation has authorized use of the FRS frequencies and equipment similar to that in the US. However, dual-mode FRS/GMRS equipment is not approved in Mexico, so caution should be exercised in operating hybrid FRS/GMRS devices purchased elsewhere. Dual-mode GMRS/FRS equipment is also approved in Brazil (GMRS only in simplex mode, GMRS frequencies 462.550, 467.550, 462.725, 467.725 are not allowed) and most other South American countries. Portable radios are heavily used in private communications, mainly by security staff in nightclubs and malls, but also in private parking, maintenance, and delivery services. Many personal radio services similar to the FRS exist around the world. Because radio spectrum allocation varies around the world, a personal radio service device may not be usable outside its original area of purchase. FRS equipment may not be legally permitted in other countries because it uses frequencies allocated to services such as police or fire; however, many countries have equivalents to the FRS. ↑ "EB - Spectrum Enforcement Division". Federal Communications Commission. 26 January 2010. Retrieved 31 January 2011. The Spectrum Enforcement Division is responsible for resolution of complaints involving public safety and technical issues such as tower registration, marking and lighting and equipment requirements. The Division is also responsible for taking enforcement actions regarding such violations as unauthorized construction or operation of radio stations. ↑ "'RSS-210, Issue 9 - Low-power Licence-exempt Radiocommunication Devices (All Frequency Bands), Annex E'". Industry Canada. Retrieved 4 November 2016.